The Charlotte Crosby Show is currently one of the most popular programmes on MTV. It follows the life of everyone’s favourite Geordie lass Charlotte Crosby as she faces life’s trials and tribulations. She climbed the ladder to fame by her role in Geordie Shore from 2011-2016 during which time she also won the 12th series of celebrity big brother in 2013. She began starring in her own reality series in 2018 alongside guest appearances on this morning, Britains Got Talent and Celebrity Juice. Charlotte has also produced a fitness video following her huge weight loss which became the UK’s fastest-selling fitness DVD, selling 101,000 copies in its first four weeks on sale. 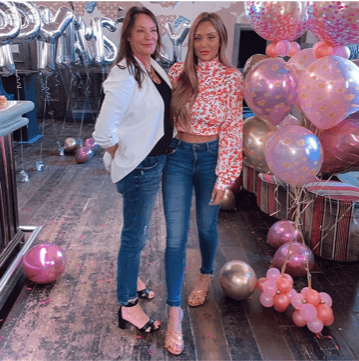 Yesterday afternoon Charlotte hosted a special Mothers Day party at the Bon Bon Bar in Newcastle for her mum Letitia and her best friends Lauren and Sophie’s mums Eileen and Eunice. Charlotte booked 3 of our top Butlers with Bums to serenade the ladies with red roses and serve them prosecco for the afternoon! The party has been featured in The Daily Mail today. Keep an eye out for our handsome hunks in the weeks to come during Charlottes Show as you may get a sneak peek at their yummy bums too!